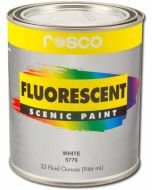 This is a test kit which contains a single one ounce container for each of the 9 colors in the Rosco Fluorescent lineup. Great for small scale mock-ups or just to experiment with colors! 4.13" x 22.88" x 3.65"